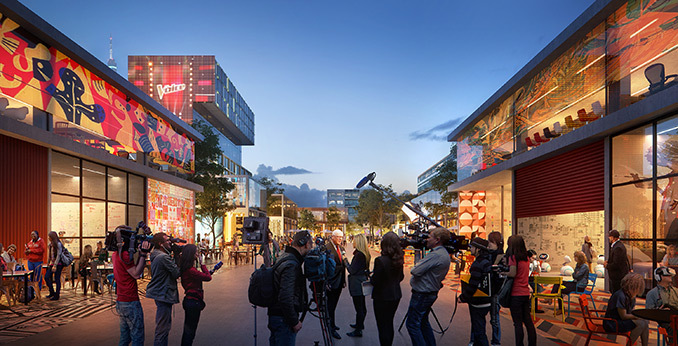 In 2017 UNStudio was selected by the Hilversum Municipality and Media Park Enterprise to develop an urban vision which could offer a roadmap for the transformation of Hilversum’s Media Park into a vibrant and leading destination for future media content creation. Once only created by professionals in high-tech facilities far removed from the public eye, today media is being produced and consumed by everybody, everywhere. 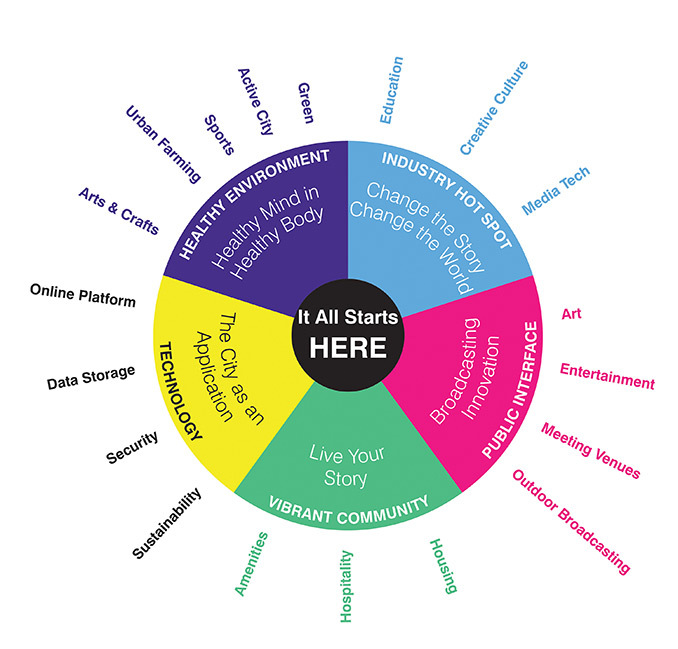 New technologies have created abundant new possibilities for media creation and consumption. 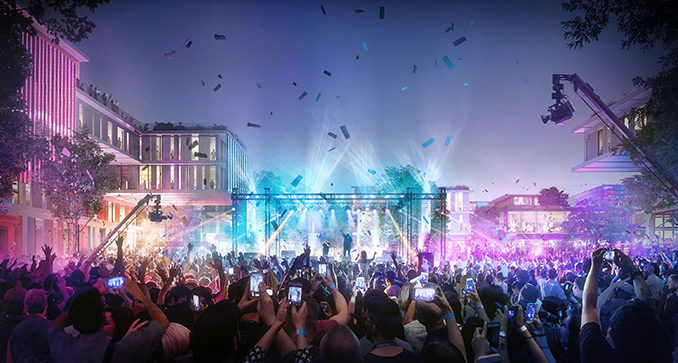 The new Hilversum Media Park will be adaptable to this evolving environment and attract top-tier young talent in order to ensure its continued success. 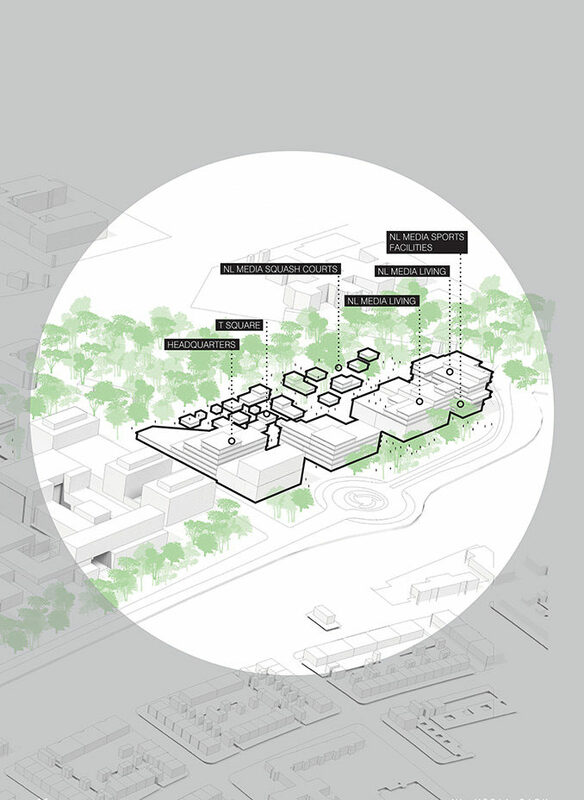 With these goals in mind UNStudio’s vision proposes 5 ‘Pillars of Growth’ for the park. These are the keystones of the urban vision which will evolve the Media Park into a successful and thriving destination for the future. The urban vision aims to create an industry hotpot by enabling cross-disciplinary links between once disparate sectors of media. VR developers, film producers and many different kinds of creatives will work side-by-side, sharing knowledge and innovation. Additionally, on-site Media and Technology-focused educational facilities will drive young professionals to close the gap between learning and working and position the Media Park as a diverse hub of industry and content creation – a place where talent can grow. Innovation in media has also enabled new ways for contemporary audiences to participate and engage with content. 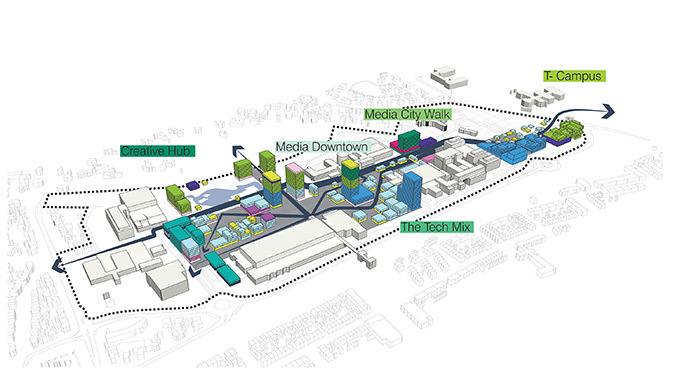 The Hilversum Media Park of the future, therefore, aims to create a vibrant public interface that incorporates these shifting conditions by providing a wide variety of innovative amenities. Open air studios, meeting venues, and increased modes of interaction create a social ecosystem where innovation is a spectacle and a community of interested parties can come together. 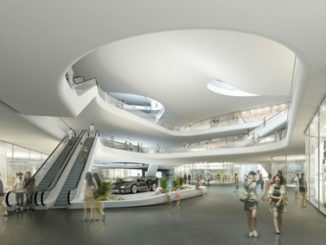 The park will also serve as a hotbed of culture, strengthening the activities of the Museum of Sound & Vision. Creative people often seek a dense, lively, 24hr lifestyle. 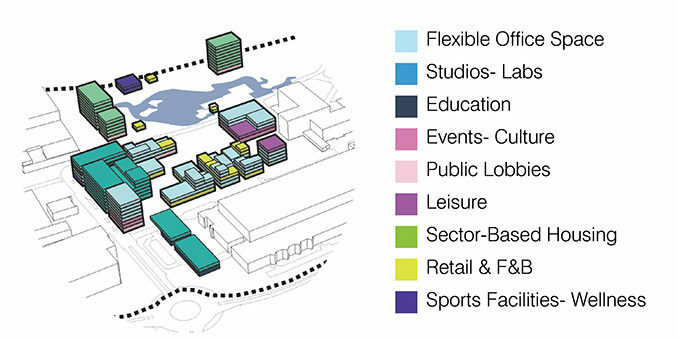 As such our urban vision incorporates facilities that can provide these functions. Hospitality and local amenities will cover the every-day needs of users, while the introduction of sector-based short-term living accommodation in a contemporary, modular style that is geared towards young professionals, sews the first seeds of a new, park-specific community. Currently, the Hilversum Media Park has an unparalleled digital infrastructure which has enabled it to become a leader in broadcasting. In the future, media tech prototypes and pilot projects could be tested on site, while the possible introduction of a sensory network could inform users’ awareness of stresses in the system. Spaces would be made available for research into technologies such as hologram tech and artificial intelligence. Additionally, facilities and buildings will be upgraded to a smart network that can mitigate shortages of any kind and respond in real-time to needs that may arise. A proposed app specific to the Media Park will also infrom users about issues such as climate, navigation, available meeting spaces, employment opportunities, etc. Hilversum’s existing identity as a Green City is embedded into the urban future of the Park and is a contributing factor to its healthy environment. Our urban vision extends the green vegetation to the west of the site into the park, further linking the media park to its surroundings. Additionally, the vision incorporates traditional healthy amenities, such as sports and recreation areas, whilst unlocking more innovative solutions, such as the incorporation of urban farms. The concept of the festival is certainly not a new phenomenon for the music industry, but in recent years it has transformed into a growing market for artists and communities in a wide variety of disciplines. Our urban vision updates its programmatic aspects by setting aside numerous ‘Spaces for Celebration’ that can be used for everything from art exhibitions to concerts, contributing to the festivalisation of media culture and turning an exclusive industry into an inclusive celebration. The city of Hilversum has been engaged in multiple schemes to improve the existing infrastructure and to alleviate congestion in and around the Media Park. 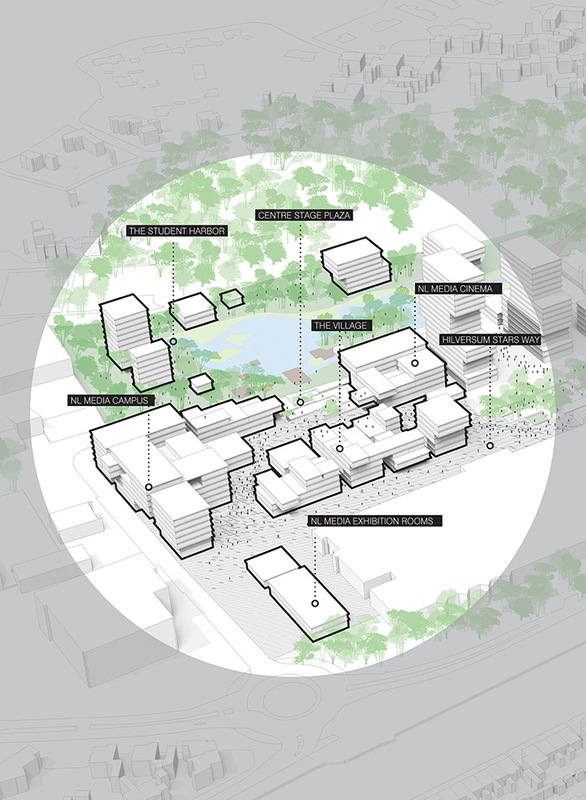 Our urban vision offers a multitude of connections into and out of the park, in addition to a variety of strategies that may be considered as a series of steps for a future that is more sustainable and mobile. Some examples include: the introduction of Park&Ride facilities with a cable car connection, widening Johannes Geradtsweg Bridge to increase capacity and developing an app specific to the Media Park to provide mobility updates. Within the Park bike and pedestrian paths are seamlessly incorporated to encourage green modes of transportation. The urban vision includes the aim of the Media Park to contribute to a sustainable future by reducing CO2 emission by 90% by the year 2050. Currently, the first step is to create an energy analysis of the park and use this to create a smart energy strategy, which will identify areas for improvement. Other planned actions include the addition of vegetation, re-use of resources, non-polluting modes of transport, climate-neutral buildings, solar panels and many more sustainable interventions that will allow the Park to reach the goal set out in the urban vision.